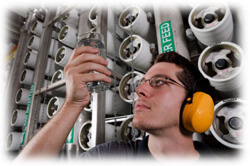 Why use a Reverse Osmosis System? We all know that clean water is a necessity for healthy living. You would not want to drink contaminated water would you? If you would not want to drink contaminated water, then why would you want to clean with it? We clean everything with water, from our bodies to carpets to windows, so an easy way to keep bacteria from spreading is to make sure the water we use is clean and free of contaminants. Osmosis is the process of water moving from an area of lower solute concentration, to an area of higher concentration across a semipermeable membrane. Water does this naturally to balance itself out. This semipermeable membrane will only let the water molecules through, so the solutes have to stay on the sides they started on. By applying a little pressure, we can reverse this process and move water that contains salt, manganese, iron, fluoride, lead, calcium and other various solutes to a new area with no contaminates1. This is the mechanism by which commercial reverse osmosis systems (RO systems) produce pure, clean water at affordable costs. You may be wondering, “How small are the pores of this semipermeable membrane?” This is a good question as the size of the pore will determine what can pass through the membrane. These pore sizes are measured in microns. You may not have heard the word “micron” before, but trust me when I say it is small. A micron is 0.001 millimeters. If you think that is small, think about this: the filter of a reverse osmosis system has a pore size around 0.0001 microns! Let’s take a minute to compare reverse osmosis to some other filtration methods, just to prove my point. Drinking- An RO system is very useful for people living in rural areas who have to depend on rivers and streams as sources for their drinking water needs. Travelers who depend on local water from ponds or rivers in the course of their camping/boating/fishing trips also do not have access to clean drinking water. They can use a reverse osmosis system water filter to get safe drinking water. Window Cleaning- RO systems have become quote popular among window cleaners due to their ability to provide a spot free shine. Window spotting is caused by the calcium in hard water. A reverse osmosis system eliminates this calcium by not letting the calcium through the semipremeable membrane.1 By using pure water and reliable window squeegees, you can get spot free windows and leave a good impression on your customers. Car Washes- If window cleaners use it to prevent spots on buildings, why not on cars? It is becoming quite popular to install a reverse osmosis system in your car wash to achieve a spot free rinse. Carpet Cleaning- Using a reverse osmosis system is a no-brainer when it comes to carpet cleaning. Leave your carpets free of bacteria and softer than ever by using pure water with your carpet extractors. Choose the best car washing equipment for your needs. Applications of different types of squeegees.